It seems to be a persistent complaint about contemporary art in general and the Turner Prize candidates in particular: their art is too "conceptual." Last month's announcement of Susan Philipsz as the 26th winner of the Turner Prize, the U.K.'s highest contemporary art award, has come and gone without causing much of a stir. Perhaps this shows that, after 25 years, the Prize has achieved at least one of its aims: the acceptance of contemporary art into mainstream culture. This time, no major outcries were heard from the establishment, nor cheap jokes cracked in the populist press. 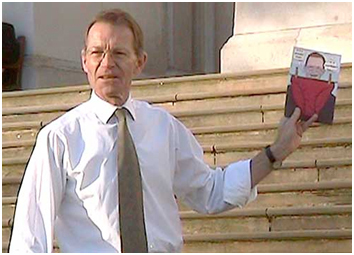 As former jury chair and director of the Tate Modern, Nicholas Serota, put it: "The result [of the Turner Prize] has been a steadily growing public awareness that art takes many forms and addresses issues beyond the conventions of representation and 'beauty.'" In good art historical tradition, the name became a badge of honour and so, through the joint effort of co-founders Billy Childish and Charles Thomson, the Stuckist movement was born. 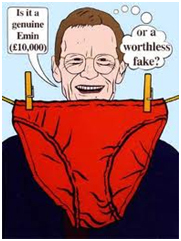 Thomson made their views clear in his satirical painting Sir Nicholas Serota Makes an Acquisitions Decision (2000), and the tone was set. Although the Stuckists are but a small and eclectic group of disaffected artists, they nevertheless voice what seems to be a persistent complaint about contemporary art in general and the Turner Prize candidates in particular: that their art is too "conceptual." But what does it mean for art to be too conceptual? 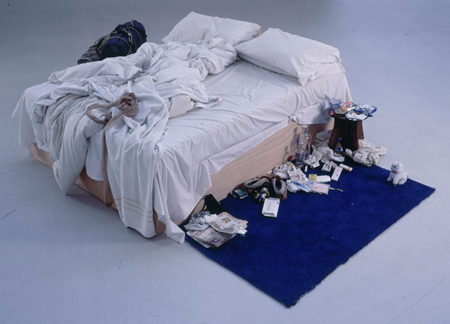 The term "conceptual art" has been used in many different senses; let me just mention five. First, in its original technical sense, it refers to art in which (as Sol LeWitt put it) "all of the planning and decisions are made beforehand and the execution is a perfunctory affair." Sometimes this means that the work is not executed at all: The viewer is left to contemplate a blueprint or a set of instructions on the wall. The second sense refers to art which takes as its primary subject matter the development of art itself, turning the work into an in-house conversation. Although this is often criticized as navel-gazing, we ought to remember that all ground-breaking art throughout history has had such an initial in-house dimension, as innovations can only be introduced—and be recognised as such—against the backdrop of established practices in the past. The third sense applies to art which deals with complex social or cultural issues—gender, neo-colonialism, identity—but in such a heavily theory-laden way, often drawing on specialist, deconstructionist, literary theory, or media studies, that it loses all connection to the average viewer's day-to-day experiences and can end up seeming pretentious and elitist. Fourthly, for some—including some Stuckists—the term is used for any art which is not conventionally figurative or aesthetically pleasing. In its fifth and most general sense, however, the term "conceptual" refers to all art in which the concepts or ideas involved in the work take precedence over its sensuous, aesthetic, and affective dimensions. The question now is whether, as the Stuckists claim, all Turner Prize candidates have always been "conceptual" in this fifth sense. Have they always put ideas above materiality, concepts over sense perception, theories over direct experience? One could argue that although all works ever considered for the Prize do indeed have a conceptual dimension, this dimension has not always trumped everything else. There have been different degrees of conceptuality. For instance, consider the work of the four candidates for this year's Prize. The most conceptual candidate by far was the theoretically complex multi-screen video installation of The Otolith Group, an artists' collective engaging issues surrounding visuality and image production in film and the media. Their multi-layered deconstruction of the 1989 French television series The Owl's Legacy, on the subject of Ancient Greece, was interesting and thought-provoking, but it required a lengthy reading of the booklet—an integral part of the installation—in order to make sense of it. This was conceptual art at its extreme: theoretically demanding and stimulating, but visually confusing and unrewarding. Compared to this work, the contributions of the other candidates appeared relatively (even if deceptively) simple. Dexter Dalwood's paintings look conventional until you begin to notice the collage-style references to historic paintings and events. This conceptual dimension of his work, however, is not an end in itself. Dalwood's atmospheric paintings subtly explore the mood and feel of places associated with well-known moments from recent history. By leaving the main protagonists out of the picture and focusing on the space in which the events took place, he seems to charge these locations with added meaning and transform our memories of them. 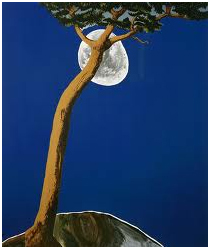 This can, for instance, be seen in his 2008 painting Death of David Kelly, based on the British weapons expert's tragic suicide (his body was found at the edge of a forest). A similar dynamic occurs in Angela de la Cruz's work. On the one hand, there is certainly a strong conceptual element. De la Cruz draws attention to the physical materiality of a work of art by breaking the wooden frames of her 2-D canvasses, then re-assembling the brutally twisted and convoluted elements into 3-D sculptures. So on conceptual terms, she raises an ontological question regarding the nature and status of a painting. However, this question does not overshadow the affective and expressive aspects of her work. 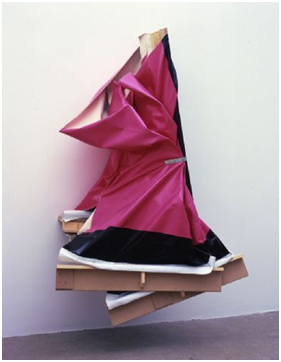 The resulting sculptures can be seen as visual metaphors of the effects of global destruction and disaster (bombings, earthquakes, floods), of human disability (de la Cruz herself suffers the aftermath of a debilitating brain hemorrhage), or of the death of painting itself. They also invite us to discover expressive beauty in the midst of chaos and destruction. Something like that happens in her 2006 painting Super Clutter XXL (Pink and Brown). Of all four candidates, winning artist Susan Philipsz's work, Lowlands Away, is perhaps the best example of a piece which successfully combines conceptuality with affectivity, ideas with feeling, and mediated contemplation with immediate resonance. In the work, Philipsz plays a recording of herself singing a sorrowful 16th century Scottish lament, broadcast in the gloomy spaces under three of Glasgow's bridges over the river Clyde. The lament, a song about a drowned lover returning to haunt his sweetheart, is rendered in three versions which overlap at the beginning and the end. Trained as a sculptor, Philipsz became increasingly aware of the way sound defines architectural space. As she puts it: "When projecting my voice I became conscious of filling the room with sound and this led to thinking about architecture and how sound could define space and how sometimes the space could change the sound." She began experimenting with the "sound sculptures" she has since produced and exhibited in many parts of the world. Most of these installations consist of a capella versions of folk and pop songs ranging from Irish ballads and Scottish laments to songs by Radiohead and Nirvana, often with a melancholic or haunting feel. The songs are broadcast via public address systems in busy places such as bus stations or supermarkets or, alternately, played through speakers in out-of-the-way places such as cemeteries, river banks, and even a hillside shelter. Unsuspecting passersby are often, literally, stopped in their tracks when confronted with her music wherever they may be. The reason why Lowlands Away is not, as the Stuckists would have it, "just a song," rather than a work of art worthy of the Turner Prize, is that the location and environment where the music is played is integral to the work. Philipsz's installations are meant to enhance and transform the viewers' perceptions of the physical and affective qualities of the surrounding space, evoking new resonances and fresh meanings. They probe the sensory and spatial effects of sounds on our experiences of an environment. This insight—the fact that an artist can sculpt space with sound rather than with visual and tactile media—is the strongest conceptual dimension of her work. We are reminded of John Cage's silent composition 4'33'', another conceptual work, which also aims to make the audience more aware of the relation between sounds and environment. But Philipsz's work is by no means only conceptual. Her particular way of singing and her choices of songs and locations all combine to create an unusual emotional effect. Philipsz herself explains the effect of her singing by the deliberate ambiguity she bestows on it, seeing it "not as a performance, but as if I am singing to myself [...], neither passionate nor sorrowful but [including] elements of both." Likewise, her choice and reconfigurations of old folk songs—often dealing with gender issues, loss and loneliness, absence, and death—allow for new readings of otherwise familiar poems and stories. She says she is interested in the ways songs "can trigger memory and redefine a place." Philipsz's art functions best in public spaces. In her Sunset Song (2003), for instance, she sings two renditions—one from a male and one from a female perspective—of The Banks of the Ohio, a well-known 19th-century American folk ballad about a romantic tragedy that ends in murder, in Ohio's Wexner Center. When performed at the Center last year, it was broadcast powered by solar panels along a walkway connecting the Center with another building, its volume changing according to the light conditions through the day and fading with the setting of the sun. But it can still be appreciated in the empty space of a gallery. In fact, Philipsz treats gallery space as just another "public space" to be explored and re-experienced as any other, bringing out the relation between a work and its surroundings. This reminds us of Martin Creed's 2001 Turner Prize winning installation Work No. 227: The lights going on and off (2000), which also treats the museum as a theatrical space for some aesthetic event or experience. Creed says that he means his work to express human indecision, filtered through the common experience of not being able to decide whether you want the lights on—or off. Yet, unlike Creed's work, which is predominantly conceptual, Philipsz's work speaks more directly to the senses. Of course, hearing Lowlands Away in an empty gallery room is very different from hearing it in the gloomy and seedy spaces under Glasgow's bridges. Yet there is a strange and melancholic quality about Philipsz's untrained, intimate voice which cannot but fail to draw you in, even in the comparatively sterile surroundings of a white cube gallery. This year's Turner Prize winner is, again, certainly interesting. It is a work which, unlike many previous winners, has an immediate emotional resonance and public appeal, yet also contains a strong conceptual element, not least through its introduction of a new genre of art: sound sculpture. Perhaps this choice signals a dawning awareness that conceptual art in its more extreme forms—the art where the idea takes precedence over the aesthetic—has had its day. With the exception of The Otolith Group—which is more or less overgrown by its own theory—it seems that all of this year's Turner candidates were somehow able to connect with the body and speak to the senses. To put this more precisely, all candidates achieved an allusive expression of affective human experience, the kind of artistic expression which can enhance and deepen our understanding of some aspect of our world. But before traditionalists rejoice, they should also note that, in all cases, the candidates accomplish this aesthetic achievement simultaneously with a sophisticated awareness of the state and development of the history of art itself. This indicates that for any art to count as contemporary, there has to be some kind of conceptual element to it. In other words, for art to be taken seriously as contemporary art, it has to be self-reflectively aware of its own position in relation to the history of art and to recent developments in the world of contemporary art itself. I don't think this is necessarily an unreasonable requirement. Any significant contribution to the world of science and scholarship in general is routinely measured by what someone can add to the ongoing conversation in a particular field. Professional societies live by it; journals insist on it as a criterion for publication; why would the world of professional contemporary art have to be held to lower standards? In his book On the Strange Place of Religion in Contemporary Art, Chicago art theorist James Elkins argues that there is no place for "sincere religious art" in the world of contemporary art. Some read this as yet another sign of the anti-religious sentiments in the world of contemporary art. Yet, if the above is true, this may be read in a different light. "Sincere Christian art" is not generally known for its contemporary feel or cultural savvyness. In many cases, it does not have to be. Not all art, whether Christian or not, needs to (or is meant to) compete for contemporary art prizes or international shows. It is not bound to meet the expectations of the world of professional contemporary art. It has other vocations. But those who do want to bring a distinctly Christian voice to the world of contemporary art cannot afford to be naive about its developments and expectations. We should be well-informed and knowledgeable about those developments and self-aware about our contribution to the conversation. So, rather than just joining the Stuckists in their annual complaints against the conceptuality of contemporary art, perhaps Christians can raise the game by producing works which do not only understand the times, but shape the times by their outstanding depth of thought and richness of feeling. 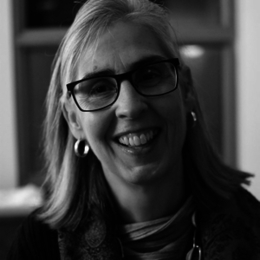 Adrienne Dengerink Chaplin (PhD) is an Independent Scholar in Philosophical Aesthetics. Originally from Holland, she taught for eight years at the Institute for Christian Studies in Toronto and, more recently, at the Department of Theology an Religious Studies of Kings's College London, where she is still a Visiting Research Scholar. She is the curator of the exhibition ‘Art, Conflict and Remembrance: the murals of the Bogside Artists’ and is currently working on a book on the philosopher Susanne K. Langer to be published by Bloomsbury in 2018. She lives with her husband Jonathan Chaplin in a small village near Cambridge in the UK. SIX QUESTIONS . . . The new culture I am making is an attempt to say hold still and look at this.